Recycling and deconstructing have been trending for quite some time now and have reached critical climax what with every other emerging artist/designer using it as a go-to medium. However hesitant to be the modern artistic cliché, Baguio is coming to its own in found art. The distinction is in how an object is represented or processed – which is not always a sail away from local or localized techniques in the arts and crafts. These representations and processes can however also see themselves inspired by development friction, of the industrial or cultural kind, but always experienced by the artists as a collective effort (it sounds strange in English but picture bayanihan as a mental-spiritual process – it seems grand but things always are if they’re new). Found art is technically verging on non-art. What saves it is a good (or goofy, as often the case with the Filipino Artist) title and some big idea to give the audience a proper shock. But this exhibition tries to question that without grand philosophical gestures. More aptly would be to describe it as a naïve reflection of found art that is less idiosyncratic than most would easily otherwise care to blurt after seeing the kind of found art and its variations that has ravaged (to put it modestly) the “proper” art of our time. What is held subconsciously precious by the artists in this show is an almost naïve way of reacting to or being obliged by the tenets of found art, especially its branch of trash or junk art – which in truth is the reason why this piece of writing is probably being reformatted into its very own trash art as it is juxtaposed with the art itself. Also, some of the artists’ works represent found art with the traditional fine arts and the arts and crafts. The idea is always a following for artists who seem to have the consciousness of fringing the fringed in whatever sense albeit in different levels, like grounded but flighty mysticism. 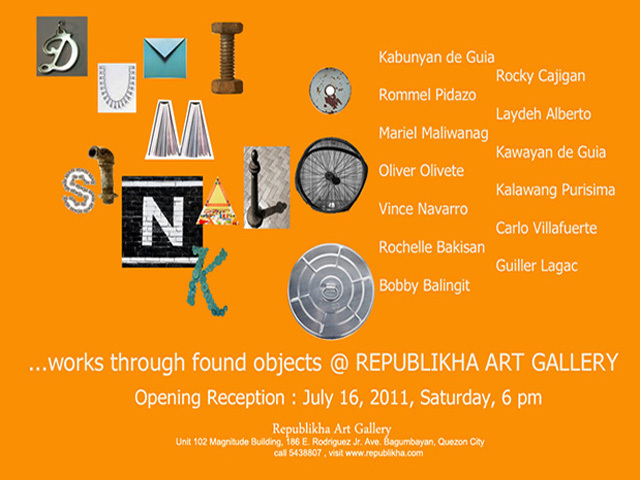 These range of works by Baguio-based (or -kook, -babied, -loved, -challenged, or -once-upon-a-time -based) artists Kabunyan de Guia, Rommel Pidazo, Kawayan de Guia, Mariel Maliwanag, Rocky Cajigan, Oliver Olivete, Laydeh Alberto, Kalawang Purisima, Vince Navarro, Rochelle Bakisan, Carlo Villafuerte, Guiller Lagac and Bobby Balingit showcase Baguio art inspired found art in a multi-dimensional yet collective manner.